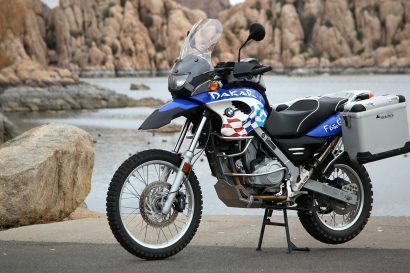 Most riders toil endlessly to find the adventure bike suited to their specific travel style. Some seek creature comfort while others, utilitarian design alone. 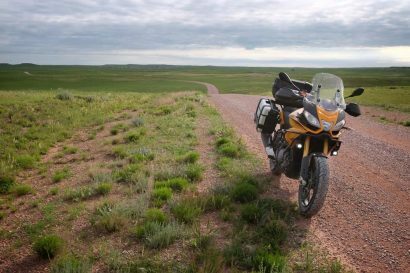 As my own adventure travel preferences have evolved, I have found off-road lightweight maneuverability and performance, coupled with longevity, paramount. Enter the interesting prospect of the Husaberg 570 FE… then add a little custom love. The core of the Husaberg 570 is an ergonomically optimized, fuel injected, woods racing bike. Essentially, Husaberg stroked the KTM 530 motor, rotated its orientation to centralize rotating mass, placed it in a different shell and re-breathed life into it through a flawless EFI system. At 250 pounds this may not sound like the beginnings of an international adventure travel bike – or is it? 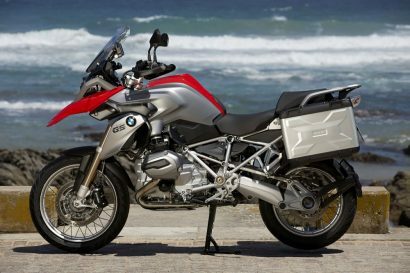 Traditional limitations to high-performance, lightweight bikes for international adventure travel have been low oil capacity, non-static valve systems limiting longevity, transmissions with on-pavement stress issues, low stator output and a lack of an electric start. The stock 570 solved a number of these problems: a respectable 1.35 liter single-chamber oil capacity, a valve system exhibiting little to no valve movement, an internal stress dampener in the clutch, a stator nearly as large as most v-twins, and an e-start (as always on the KTM’s and Bergs). Stock, the Husaberg 570 has an oil capacity suitable for domestic trips, but when international riding demands longer distances, a little ingenuity is in order. Upon returning from a few weeks southwestern US trip last spring, I noticed that the frame rails extending from the head tube down to just above the foot-pegs appeared to be sealed containers. This lends them to being an excellent chamber for an oil reservoir/cooler once plumbed. The first step was to drill, tap and pressure test the chamber with a Schrader valve. The air bleed rate was sufficient to retain oil under operating pressure. Yes, a built-in, nearly indestructible oil reservoir – two of them! The internal volume of each rail came to 410cc, for a total oil capacity increase of 820cc, bringing total oil capacity to roughly 2.15L, comparable to most big fat high-volume bikes – the secret to longevity. Now it was time to have some high-pressure steel-braded brake lines cut in the direction that the oil flows. This involves one cable extending from the cam chain tensioner gallery to the bottom of the left frame rail. Oil then flows through the rail, out the top and is then cabled to the bottom of the right rail where it rises again and is transported via cable to the oil cap and back into the engine through the oil filter gallery. Two major steps were needed to make this system work: 1) the existing oil filter cap needed to be drilled and tapped and 2) custom components needed to be milled, lathed, tapped and welded into place to secure the banjo bolts with sufficient thread-depth to the frame. Additionally, a one-way valve was constructed into the 10mm banjo bolt at the cam chain tensioner gallery to eliminate gravity over-feeding of oil back into the motor when the bike sits. The system has seen over 4,500 miles and 140 hours of off-road international travel thus far and is yielding oil as golden as new after 2,000 mile change intervals. This oil capacity increasing option is absolutely pivotal to making the 570 an international travel bike. Among other things, Husaberg’s new 70 degree engine design leaves ample space for motor clearance behind the front wheel. Enough in fact, that I put the extra space to good use. With access to a metal bender I was able to shape a sheet of aluminum around the case. I then cut grooves into the newly-molded guard to design a removable tool/water box unit. The wide engine guard functions great for protection, but also keeps the engine clean while riding. The beauty of the box is that it is completely removable for trail riding, can be locked, and is interchangeable should one wish to build boxes of other sizes/ functions. Additionally, when on the road the box blends in as part of the motor, unsusceptible to thieves. Maybe it’s not much more than a glorified 6 gallon water jug, but it has proven to be one of the most useful items in my travels. Imagine having a waterproof trunk in the entire space above your front fender. Your light moves forward to the front and a nice control panel built into the face (I opted for aluminum). The entire face of the box makes an excellent flat surface, map placement area, and in my case I built a quick flip-up lexite windshield perfect for those unwanted, but often necessary highway sections. This box starts more conversations than just about anything else on the bike. Locals usually think it’s full of water or gas (better than them thinking its full of cash), while travelers on the party curcuit only dream of the cooler of ice cold beer it holds. Whatever the case, the combined strength from its triple clamp bracket and fender bracket utilizing upward and downward force are enough to hold a small child. The only flaw so far has been fatiguing in the aluminum plate where it connects to the bar risers. I would recommend that anyone building an adventure box use a hinge or plastic buffer between the two to soak up vibration. Ever note the huge area inside a typical swingarm? During a night admiring the grandeur of my Berg, I noticed that the swingarm, with a few modifications, is nothing but a sealed aluminum drinking container. All one needs to do is silicone the plastic plugs, tap and plug the 2 drain holes, drill and tap a new hole at the back left for a Camelback nozzle and add a breather valve. As one can also see in the photo, I added a quick aluminum guard to keep the valve from breaking off. 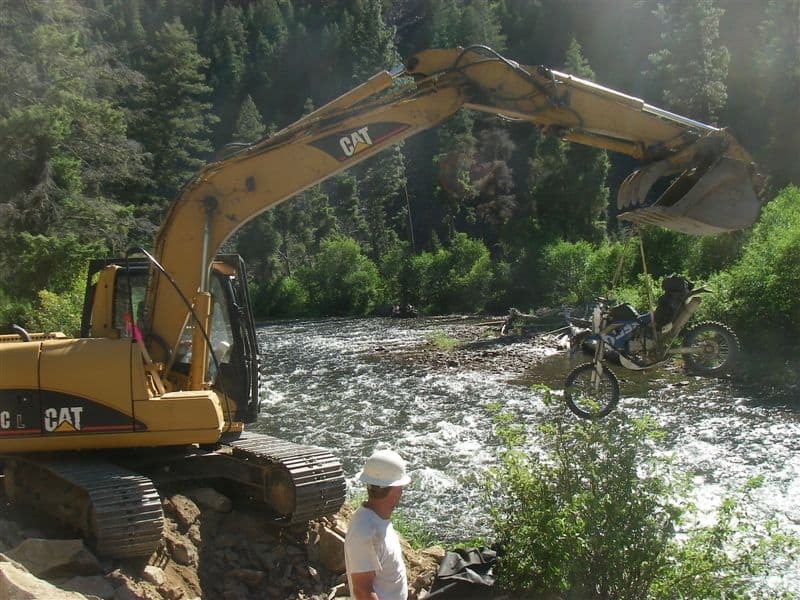 Once complete, the swingarm can be gravity fed and emptied. The Husaberg/ KTM swingarm on my bike holds around 2.5 liters and takes only a few moments to fill or empty. As my 570 sits, I have four individual tanks with a total of 8.2 gallons of fuel capacity. The stock tank (2.15 gallons) is overlaid by a Safari front tank (2.0 gallons). At the rear is a Safari Rally tank (2.6 gallons) and I was able to successfully plumb my stock plastic subframe (1.2 gallons). There may be a rat’s nest of fuel hoses, but the system distributes the weight of the fuel evenly across the bike giving a light feel even when full. Note: One of the only true weakpoints of the new Husaberg motor is debris clogging the fuel injector. I replaced my injector ($150 part) in Mexico at 7,000 miles, which is not uncommon. To save the hassle of replacing an injector, be sure to add additional fuel filters in the line and change as necessary. With a lack of linkage and no carberator tubes in the way, the new Husaberg also presents the opportunity to use space behind the motor for your spare tube. Take a look at this photo (and the photo below under “Gearing”) to get an idea of how I built it using a wide washer and a large hose clamp. In case you cannot figure it out, contact me and I can make a set for you – if I happen to be in the country! Gearing- the 570 comes with 13/52 gearing, great for the trail, but not what you need for the long haul. For the sake of longevity, I always recommend finding the largest possible counter-sprocket and adjust your rear from there, as the counter-sprocket will always be the first to need replacement in the wrong country. With the assistance of a custom-built stainless case guard, the 570 accomodates a 15 tooth front, which couples nicely with a rear 47-49 tooth. Otherwise, a 14/45 is a sweet spot for low cruising RPM’s (approximately 2500 RPM at 55 MPH), while still enabling the rider to sneak up a trail to stealth camp at the end of the day. Police Strobes- After a highway-speed collision on my bike with a UPS truck outside Winslow, AZ, my mind has been focused on other vehicles seeing me. The most effective insurance I have found is installing LED police strobes in the front and rear of my bike. I found the Whelen LINZ 6 (latest technology used in emergency vehicles) to be the best option on the market. At nearly $100 a pop, they are not cheap, but have 69 flash patterns (including constant burn for night riding) and will definitely increase your ability to be seen. With basic wiring abilities, one can actuate the strobes when the brakes are hit, or set them to send out pulsating light at all times. From my experience, I have found that most law enforcement personnel have no problem with a white front and red rear strobe. Run at your own risk, although I’d rather have a ticket than end up in a wheelchair. A “Secret Ignition Switch”- Having no ignition on a bike that cost five digits can be a little nerve racking. My simple solution is to hide a power override switch somewhere on your bike. Only you know where it is and this is arguably safer than an ignition someone may attempt to jam. Additional Oil- To keep in mind: the unused tubular frame rails which run below the motor will hold an additional 800 ml of oil; just remember this will seep out as soon as you remove the bolts on the back of your skid plate. Dual Batteries- One downside to the Husaberg 570 is the lack of a kickstarter. This could really lead to a bad situation in flat, desert sand. I have built out my 570 with a dual battery system with a simple breaker in line. This way I can watch a movie off the laptop, etc. (powered off the bike) and do not have to fear a non-starter in the morning. Turntech makes an excellent battery for this application. Their 2.5 amp hour fits nicely into a backpack. Cush Hub- Despite having seen the inner-workings of my clutch and its newdampening after a little mishap, I still opted to add a cush hub to my bike for international riding. Aside from the insurance of additional dampening, the bike will additionally benefit from lesser sprocket wear and an additional double-row roller bearing to handle the bike’s torque. Making the switch from an older Husaberg or your KTM? Slave Guard- I was able to flip my Enduro Engineering slave guard around and fit it nicely. Steering Dampener/Bar Risers- With a little elevation adjustment I was able to fit my old Scotts steering dampener and risers. Radiator Fan- Do not ditch your pricey radiator fan and thermostat with your last bike. I was able to cut the plastic frame of my old 525 fan to fit around the new Husaberg radiators. Footpegs/Wheelsets- Do not forget that other common items such as aftermarket footpegs and wheelsets will also be identical. Additionally, consider the benefit of being able to wear the other side of your sprockets from previously right-drive Husabergs. After all is said and done, a high-quality, appropriately modified Husaberg 570 (or the like) will have the same, if not longer life than its generic clunky counterpart, but will introduce agility and style to your daily riding. It might even get you a little farther off the beaten path…. Look for more from Scooter soon.